In his 16 quartets for two violins, viola, and cello, Beethoven created a Mount Everest for string players and some of the most sublime, unforgettable music ever written. In this musically rich 24-lecture series, Professor Greenberg guides you in a deep encounter with these majestic works of art, offering you the rare opportunity to grasp the musical riches and spiritual greatness of the quartets in a clear and accessible way. You'll uncover the musical underpinnings of the luminous beauty, emotional depth, and dramatic scope that make these quartets legendary; examine the inner workings of one of history's most innovative minds; learn the "ritual template" of the Classical string quartet; and probe the seminal innovations of Haydn and Mozart within the template, as they set the stage for the explosive arrival of Beethoven. 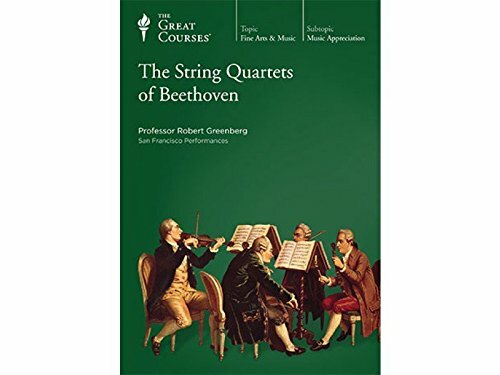 The heart of this series is a movement-by-movement exploration of the individual Beethoven quartets, revealing the arc of the composer's fierce independence and imagination as he brings to the string quartet an expressive, formal, and narrative range undreamed of by earlier musicians. You'll delve deeply into the musical innovations that underlie Beethoven's creativity in these works, including "motivic" development, originality, and contextual use of form. Each of these lectures is a rare and life-enriching opportunity to know the scope of Beethoven's genius, his most unforgettable music, and the profound humanity and beauty that live through them. If you have any questions about this product by teaching company the great courses, contact us by completing and submitting the form below. If you are looking for a specif part number, please include it with your message.